This bbq chicken recipe is lovely any time of the year. It doesn’t have to be summer to enjoy this treat when you can bake your barbecue chicken in the oven! The sauce recipe is easy and a nice mix of sweet and tangy. Heat oil in a large skillet. Brown the chicken pieces well in the oil. Spread the browned chicken pieces out in a heavy baking dish. Top with onion rings. Combine remaining ingredients in a sauce pan and bring it all to a boil. When it boils for just a minute, pour the sauce over the chicken in the baking dish. Bake for 1 hour at 350ºF, basting 2 or 3 times with the sauce. 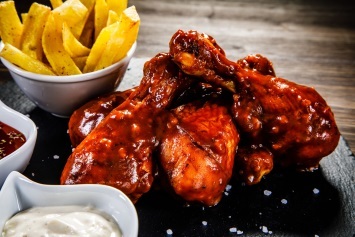 Most of us love baked chicken smothered in yummy bbq sauce any time of the year. With this recipe it is easy to put this treat on the table any day and any time of year. It mixes in just a few minutes, then bakes over the chicken to bring all the tastes together and give you a moist, tender, flavorful barbeque chicken. This is a gluten free recipe, but if you need absolutely NO gluten, you need to make sure each of your ingredients, like your ketchup, is gluten free. Just read the ingredients. You can get gluten free ketchup. In fact, most brands of ketchup are gluten free. Just make sure if it’s important to you. Serve it with twice baked potatoes and crunchy coleslaw for a perfect “summer” meal any time of the year. Or pair it with some good homemade mac and cheese for a night of comfort food. This baked bbq chicken recipe is just one of our succulent chicken recipes. Find the rest here.